In the Attic scene of the Haunted Mansion, guests can find a variety of portraits of once Constance the bride, with her many husbands over the years. The odd thing is that the marriages never seem to last. Apparently, she was a very demanding wife, and her betrothed often lost their heads over her. Well, not often--always. And the deadly secret becomes quite clear cut when guests finally encounter the dear bride. "I do... I did..." she whispers. Well, just make sure not to scorn her! 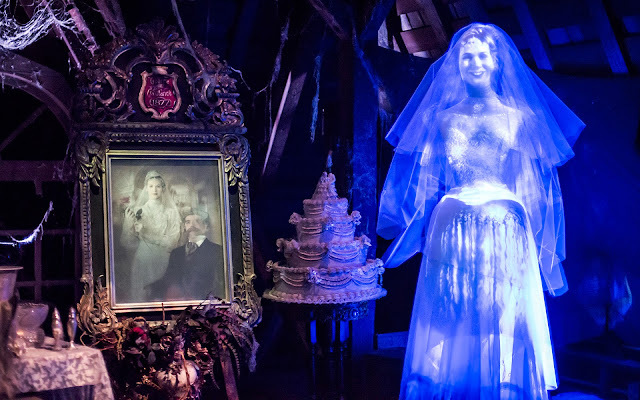 Constance, jilted bride of the Haunted Mansion, or serial axe murderer? Oh, I love this! How on earth did you get such a clear picture of her? The only times I've managed to get decent pictures inside the Haunted Mansion is when the ride has broken down (although it never breaks down in the spots I wish it would--grrr). If you captured this while the ride was in motion, what camera settings did you use? This is truly fantastic! Ditto for me; it never stops when I need it. But I got lucky, and it's mostly the camera. I used my Nikon D600 with 16-35mm f/4 lens at like 6400 ISO. Shutter speed was (don't remember off the top of my head right now) around the 1/10 or 1/20 second range.